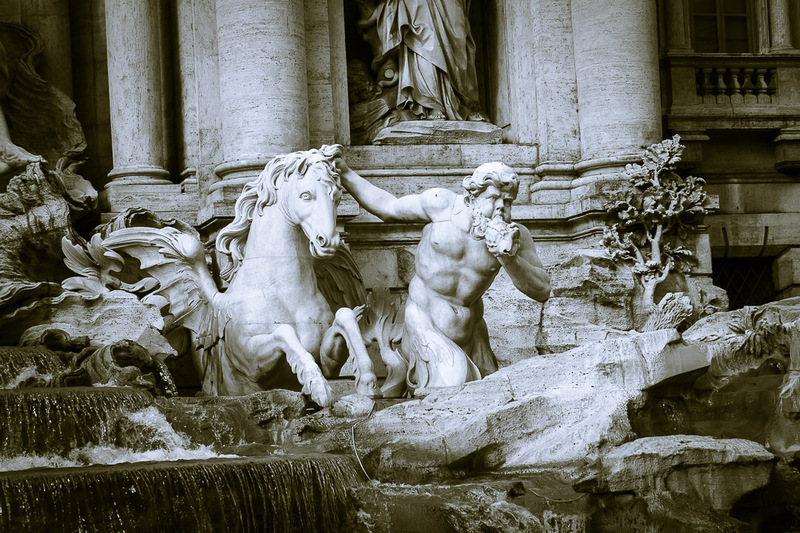 The Trevi Fountain is one of the most famous fountains in the world, and my favorite fountain in Rome. Large crowds will pack around the fountain at all times. The name of the fountain comes from the fact that it lies at the junction of three roads (tre vie). 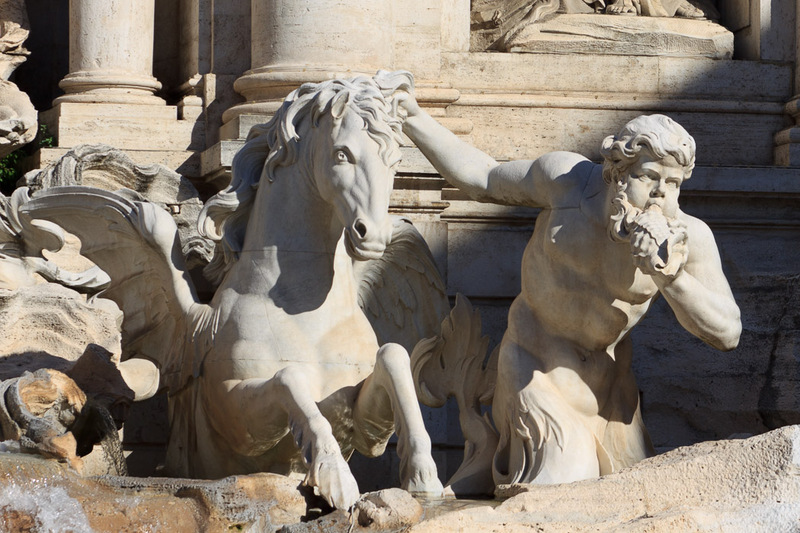 At 85 feet high and 65 feet wide, it is the largest baroque fountain in Rome. 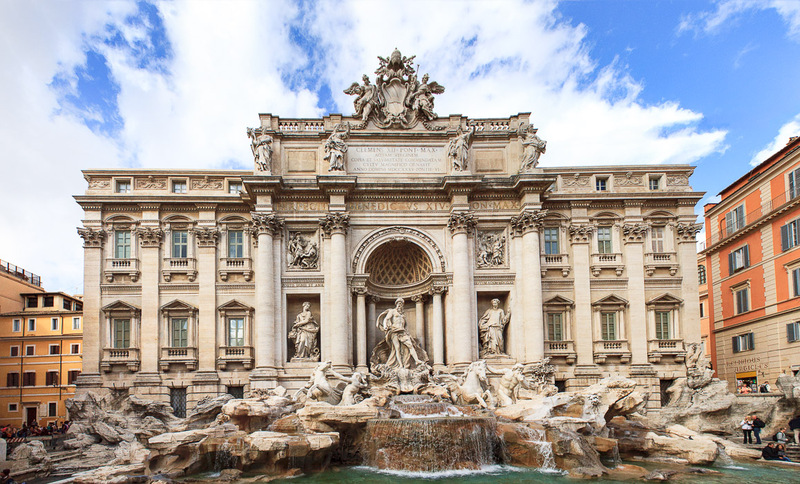 Legend states that if you face away from the fountain and throw a coin over your shoulder into it, you can guarantee your return to Rome. Because of this, an estimated 3000 euros are thrown into the fountain each day, and some of them were mine. 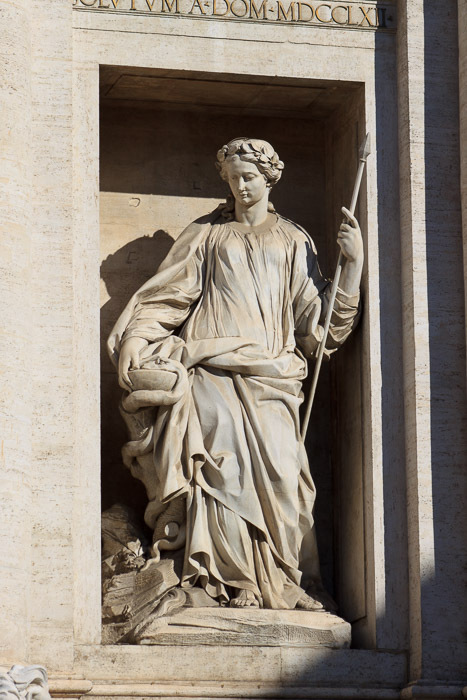 The fountain was commissioned to Nicola Salvi by Pope Clement XII in 1730, and was completed in 1762 when Pietro Bracci's statue of Oceanus was set into the central niche. It was recently refurbished in 1998. 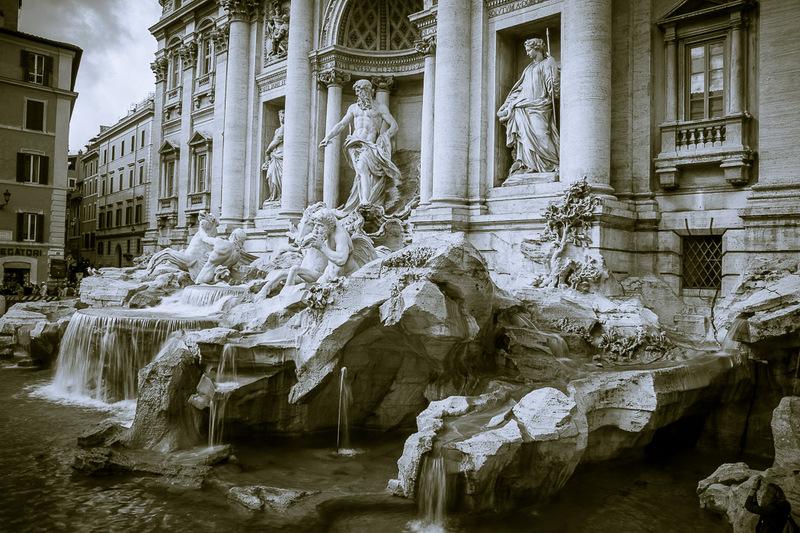 It is featured in Respighi's Fountains of Rome, Fellini's La Dolce Vita, and Roman Holiday. 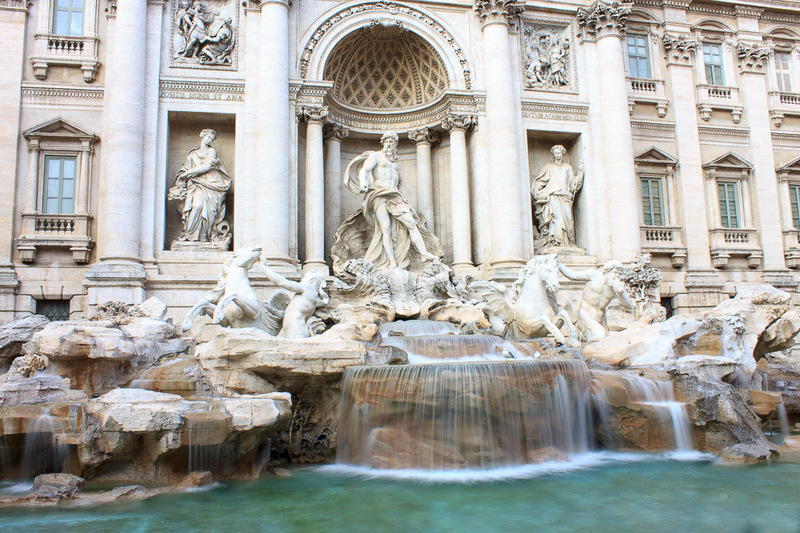 See all Trevi Fountain photos. 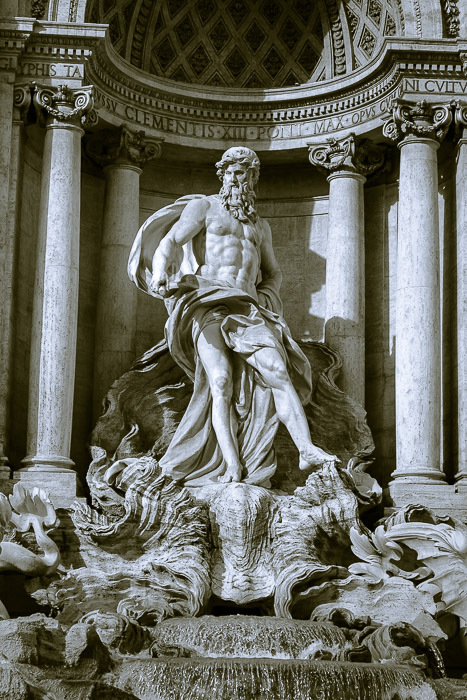 The central statue of the fountain is that of the god Oceanus (1st and 2nd photos below), the divine personification of the World Ocean, an enormous river encircling the world. 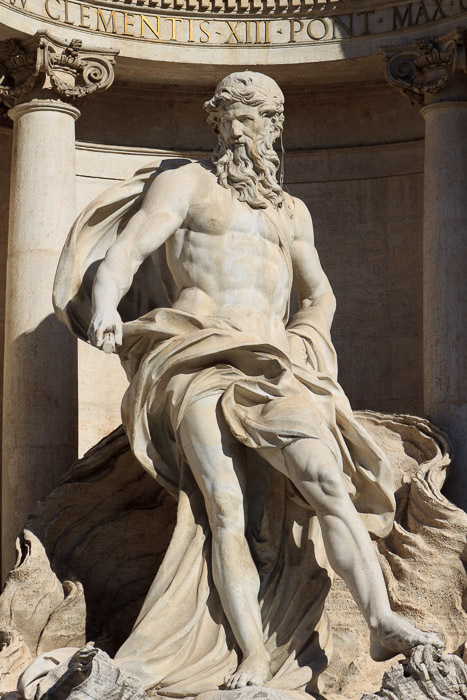 You might read that this statue is Neptune, but it is not. Oceanus is carried on a chariot made of a sea-shells by two horses being jockied by two Tritons. 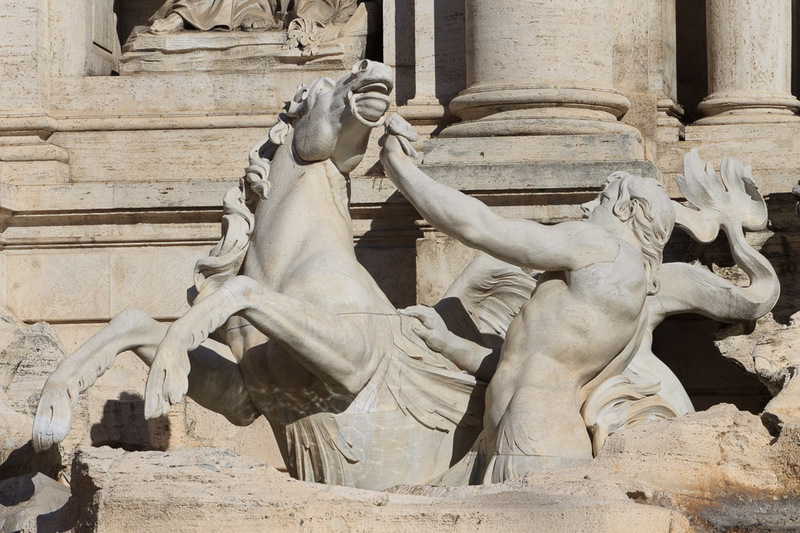 The horse on Oceanus' lower-left is the restless horse (3rd photo below), jockied by a strong and young triton. The horse on Oceanus' lower-right is the calm horse (4th and 5th photos below), jockied by an older Triton that holds a conch shell used to announce their passage. The restless and calm horse represent the fluctuating moods of the sea, sometimes stormy, sometimes peaceful . 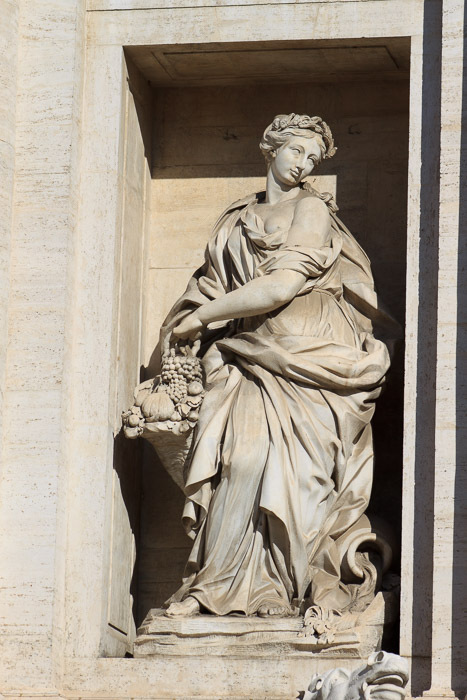 Beside Oceanus on the left is a statue of Abundance (1st photo below), holding her horn of plenty filled with fruits and produce. At her feet is a toppled vase with blooming flowers in a source of water. 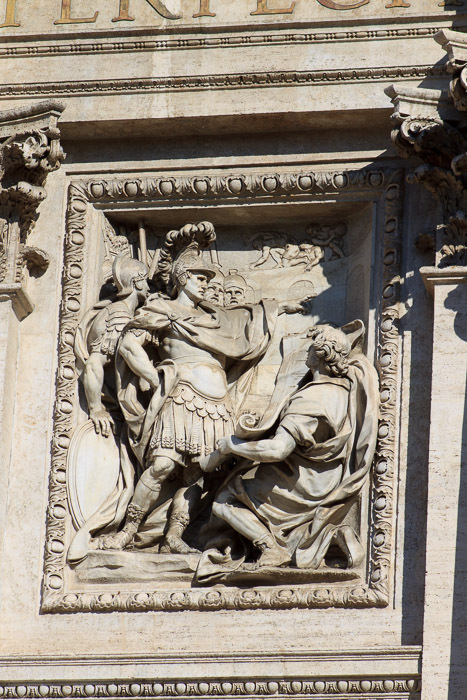 Above Abundance is a relief, by Andrea Bergondi, showing Marcus Vipsanius Agrippa, a friend of Augustus and the builder of the Pantheon, commanding his generals to build the Aqua Virgo (2nd photo below) in 19 BC, which supplies water to the Trevi Fountain from 8 miles away along a path that meanders 14 miles. That aqueduct was destroyed by the Goths in 537 AD, an act that put a nail into the coffin of the defeated Rome. The modern Acqua Vergine now supplies the fountain, and in fact, the fountain was built at the endpoint of the aqueduct, as many fountains in Rome are built at the end of an aqueduct. Beside Oceanus on the right is a statue of Health (1st photo below), crowned by a wreath of laurel and holding a cup a snake drinks from. In Greek, her name is Hygieia, the source of the word hygiene. 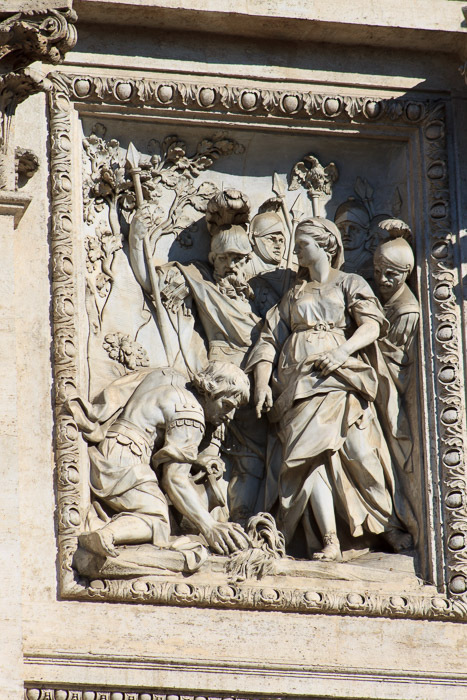 Above Health is a relief showing a virgin indicating to soldiers the source of water (2nd photo below), by Gian Battista Grossi. The top of the fountain (1st photo below) features an elaborate crest in the center, an inscription underneath, and four statues on the attic of the fountain. The statues represent the benefits of rain on the earth and four things that depend on that water supply. From left to right, the four statues represent the Abundance of Fruits as a horn of plenty, by Agostino Corsini; the Fertility of Crops, holding ears of wheat, by Bernardino Ludovisi; the Products of Autumn holding grapes and a cup, by Francesco Queirolo; and the Joy of Prairies and Gardens, adorned with flowers, by Bartolomeo Pincellotti. 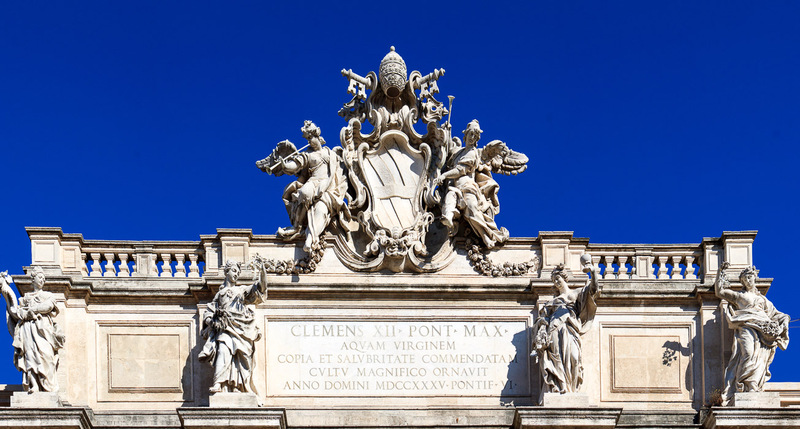 The inscription on the attic states: "Clemens XII Pontifex Maximus decorated the Virgin Aqueduct and committed it with abundance and salubrity to the magnific cult in the Year of the Lord 1735, 6th year of his pontificat". 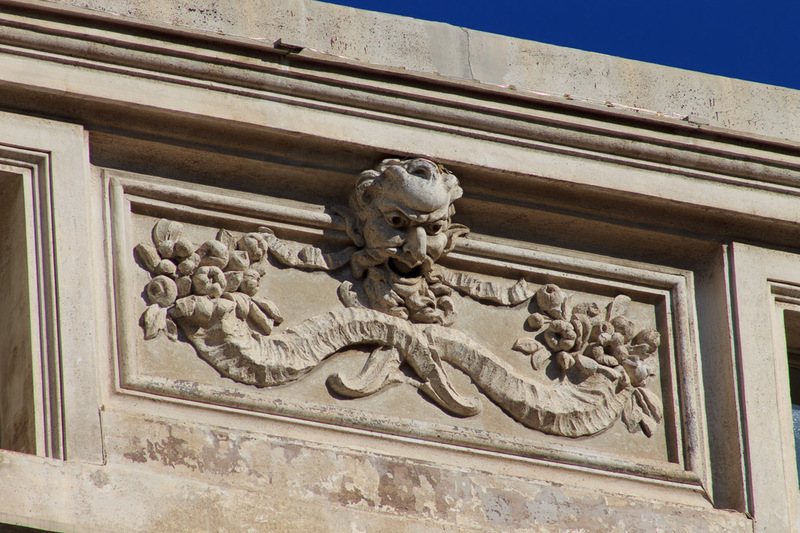 To the left and right of the attic of the fountain are 3 awesome gargoyles on each side, one of which is shown on the right.